Everyone attending the event agreed it had been a great weekend with super overall team spirit between the Basingstoke teams. After the traditional first day in Phantasialand everyone went off to host families for a great weekend of sport, hospitality, culture and building new friendships. Both England and Germany were performing well in the Football world cup which added some interest and rivalry to the visit. Coach one had a sing song for a couple of hours on the way home which really pleased their driver ! Results were Summit & AWE Judo lost to ESC Fortuna 4-6, Basingstoke & Mid Hants Athletics beat LGO Euskirchen 24,495 - 22,687, St Marys Junior School lost to Marienschule 2-4 at Capture the Flag, Totally Tennis beat TC Rot-Weiss 14-0, Challoner School beat Marienschule 2-1 at Football, Vyne School also beat Marienschule 3-1 at Dodgeball, Sherborne St John U.14 Football comfortably beat ETSC 10-3 whilst Sherborne St John U.12 also beat ETSC 6-4, Academy of Dancing drew with Co-Leg 1-1, Basingstoke Volleyball beat EVC and the Basingstoke Civic Party drew with Euskirchen at Target Throwing plus a mixture of games on the last night event resulted in a 5-2 win for Basingstoke participants. This meant that Basingstoke regained the overall bronze trophy by a resounding score of 26-8 to bring it back to England. 2017 event in Basingstoke was the 25th Annual Festival of Sport and resulted in a home defeat ! Another great Twinning exchange took place in June 2017 and after the traditional weekend of hosting, social and sporting events plus a wide range of sightseeing everyone met up for a last night celebration event at Queen Mary's College. Food and other refreshments were available between the main hall and Marquee and approximately 500 Sportsmen and Women plus families enjoyed the evening. Results were Summit & AWE Judo beat ESC Fortuna 4-3, Basingstoke & Mid Hants Athletics beat LGO Euskirchen 1380-996, St Marys Junior School beat Marienschule 8-7.5, Totally Tennis beat TC Rot-Weiss 11-1, Challoner School drew with Marienschule 5-5, Tadley Calleva Football drew with JSG Erft 5-5, Sherborne U.15 Football drew with ETSC 4-4, Academy of Dancing drew with Co-Leg 1-1, Vyne School lost 19-23 at Archery to Marienschule, Basingstoke Volleyball lost 0-3 to EVC, Sherborne St John U.13 Football lost 1-7 to ETSC, Sherborne St John U.11 lost 3-5 to ETSC and the Basingstoke Civic Party lost 1-2 at giant Connect 4. This meant that Euskirchen retained the overall trophy they had won in Germany in 2016. Couple of interesting statistics - Basingstoke have won 10 Festivals, drawn 3 and lost 12 - Basingstoke have won 107 individual events, drawn 64 and lost 113, Basingstoke & Mid Hants Athletics have won 12, drawn 1 and lost 12, Judo have won 11, drawn 3 and lost 11 whilst Totally Tennis have won all 12 events they have competed in and currently remain unbeaten. 2016 Defeat in Germany but great 30th Twinning weekend ! Many new younger participants took part hopefully to ensure that new friendships were made links continue between our towns. After the traditional light breakfast and a great day in Phantasialand for the majority, everyone met their hosts Thursday evening and a good nights sleep. Friday and Saturday were a mix of social events, visits to local attractions and of course training and sporting events. Friday night saw host clubs entertaining guests whilst Saturday evening had everyone assemble for the last night entertainment and results with Germany playing Italy in the Euro Football Championships. Germany's win resulted in big celebrations around the town late into the night. The journey home on Sunday was broken up by stops in Ostend and a Belgian Sweet and Chocolate shop prior to the ferry crossing from Calais to Dover. Basingstoke Academy of Dance had a great weekend with hosts Co-Leg Dance and Marienschule students and after learning a routine together performed it on the last night to everyone else with their event deemed a draw. A mixed Vyne & Bishop Challoner Scools Football team beat Marienschule 3-1, St Mary's Junior School lost 2-6 at 'Capture the flag' against Marienschule students. Totally Tennis retained their unbeaten record winning 12-5, Volleyball lost 0-3, Sherborne St John U.14 Boys FC lost 0-2,whilst the Sherborne St John U.12's lost 2-12 and Sherborne St John U.12 lost 6-13, Tadley Calleva Youth U.14 FC lost 1-4, Summit & AWE Judo Won 4-3, Athletics lost a close match 42-44 and the Basingstoke Civic Delegation beat Euskirchen partners at in the Civic competition. Overall result was Basingstoke 16 and Euskirchen 19 so Euskirchen now hold the trophy. 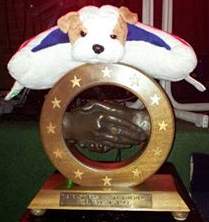 2015 - Basingstoke regain trophy in a tight result after enjoyable weekend ! Euskirchen participants had another great weekend with their Basingstoke hosts staying with local clubs and families. During the weekend groups travelled to Wembley Stadium, Central London and Windsor Castle amongst other venues socially alongside a hectic weekend of sport, swimming, picnics and Bar BQ's etc. Basingstoke Academy of Dance and Basingstoke Gymnastics Club jointly hosted Co-Leg Dance and Marienschule students and after learning a routine together performed it on the last night to everyone else with their event deemed a draw. QMC students played Emil Fischer College at Football and won 4-1, Totally Tennis retained their unbeaten record overall winning 7-3, St Mary's Junior School lost to Marienschule 0-5 at Bench Ball, Volleyball lost 0-3, Sherborne St John U.14 Boys FC lost 1-9 whilst the Sherborne St John U.14's win 3-2. Challoner School beat their Marienschule opponents 1-0 at Golf, Summit & AWE Judo lost 3-5, Athletics won by 1253 to 1179 and the Basingstoke Civic Delegation beat Euskirchen partners at Darts. The last night celebration event was kindly hosted by Queen Mary's College where Euskirchen visitors and host families all got together for a social evening prior to the long journey home on Sunday. Basingstoke teams travelled to Euskirchen in four coaches overnight before spending a day in the local Phantasialand before being greeted by host families. Some had early nights whilst others watched Germany continue their successful path to the World Cup Final. St Mary's Junior School, Basingstoke Academy of Dance, Basingstoke Gymnastic Club and Challoner Senior School all drew their sporting events whilst Athletics, Cycling, Sherborne Boys U.13 FC, Calleva U.12 Boys FC plus Basingstoke Volleyball lost. Summit & AWE Judo, Sherborne Boys U.14 FC plus Totally Tennis won their events. Overall Basingstoke lost 13-19 to Euskirchen. A wide variety of social events took place over the weekend with everyone having a great weekend including trips to Shalke FC, Cologne, Bonn and other local places of interest. The last night event had a great atmosphere with everyone enjoying the evening before a good nights sleep and the Journey via Brussels back to Basingstoke and Sunday evening. 2013 - Emphatic home 21st Anniversary win ! Euskirchen visited Basingstoke again arriving on Friday evening July 5th to be met by host families at the Leisure Park. Quite a few were renewing friendships with Basingstoke Sportsmen and Women but there were also a lot who were meeting for the first time. Everyone then went their own ways with hosts to have something to eat after a long day travelling and either off the bed or out for some socialising. The weather was nice and warm all weekend to be enjoyed by everyone and the first event of the weekend was Athletics at Down Grange. Basingstoke eventually won with a score of 2906 against 2885 for the first points of the weekend and this was quickly followed by the civic event which was the mayor of Basingstoke sprinting over 50m whilst the very tall councillor from Euskirchen road walked in what was a very close race but Basingstoke took the points. Sherborne St John Boys junior football played against Euskirchen TSC and were soundly beaten 0-8 on the QMC 3G Astroturf by a team which feed into FC Cologne. Overton Boys were also beaten in their game against JSG FC 1-4 on Sunday afternoon after attempting to tire the visitors out with a day in Thorpe Park on Saturday. Taekwondo drew their event on Saturday and then everyone went raft building on Sunday with most participants undertaking a lot of swimming instead ! Basingstoke Academy of Dance hosted the Euskirchen Rhonrhad team with the result declared a draw and both squads performed on the last night in a joint dance routine. Volleyball crashed 0-3 against a strong Euskirchen team. Sunday morning saw both the Basingstoke organisers and German officials having a go at the Airkix indoor skydiving with great fun being had by all and some very funny faces being photographed looking terrified or totally out of control whilst airborne ! Totally Tennis retained their unbeaten record against the German squad eventually winning 18-15 in a tough weekend of Tennis slightly distracted by Andy Murray taking the Wimbledon title ! Judo won 5-2, Junior Table Tennis 6-4, Junior Badminton 9-1 and the Time Time Road Cycle team beat their visitors overall by 3min 42 secs after cycling around the lovely Hampshire countryside. 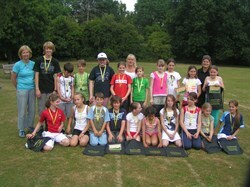 The final result was St Mary's junior school against Marienschule in a rounders match. Euskirchen set an opening score of 16 rounders to be beaten by a score of 17.5. The total overall Festival score was therefore Basingstoke 26 & Euskirchen 11 ! A wide variety of social events took place over the weekend with everyone having a great weekend and now looking forward to visiting Germany in June 2014. Trips to Bournemouth, Basingstoke Aquadrome, Thorpe Park and central London were all very popular and use of the German coaches was very helpful. The last night disco and results evening was hosted by BCOT and everyone agreed it had been a very enjoyable and successful weekend thanking the Basingstoke Sports Council and Borough Council for their co-ordination of the event. 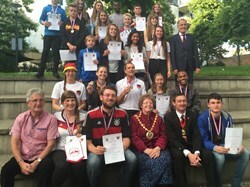 Over 150 Sportsmen and women from Basingstoke & Deane travelled to German twin town Euskirchen overnight on June 27th to arrive for a light breakfast and greeting by town officials. Everyone then spent a lovely warm day in the local Phantasialand themepark before returning back to Euskirchen Thursday evening to be met by host clubs and families. Many then watched the Italy against Germany Euro Championship game where Germany unfortunately lost. Friday saw the first event in the local village of Stotzheim when Overton and Basingstoke Taekwondo participants sparred with Kampfkunstschule Tangun Euskirchen and achieved a 1-1 draw. After lunch Summit & AWE Judo clubs took on Euskirchen ESV Fortuna beating the Germans 4-3. The Judo group had the largest travelling group and maintain one of the longest links in the Festival. Then Everest Community Academy took part in Handball, Netball and Trampoline events against their Marienschule partners with the overall result a 1-1 draw. St Mary’s Junior School competed at various sports including a fun capture the flag game but lost overall 1-5. After that Basingstoke Academy of Dance members had training and great fun with the German TV Elsig Rhonrhads which also ended with a 1-1 draw. This was followed by Sherborne St John Boys Football playing on the full size Euskirchen town pitch in the stadium against a very strong Euskirchen TSC Football team and lost 2-8. Basingstoke Junior Table Tennis played and beat Marienschule TTV 6-3. The final event of the day saw the young Basingstoke Badminton team take on another very strong German Marienschule team but losing 1-7. This was their first link and it is hoped to develop future badminton exchanges. Friday evening saw many club social events before competition restarted on Saturday morning when Totally Tennis defended their unbeaten Festival record against TC Rot-Weiss. Basingstoke had a young but talented squad and quickly adapted to the clay courts to win 8-7.The young but talented Basingstoke Athletics team took on a strong Euskirchen squad with a batch of personal bests being recorded. The overall result was a German win 115 – 147. The civic groups competed in a football goal scoring shootout and lost 2-0. This was followed by Volleyball which was another great match to watch and although Basingstoke lost 0-3 to VC Euskirchen, all three games were closely fought to the final point. The final event of the weekend was Overton Youth Boys Football against local side JSG Erft 01 on an unusual surface for football where they were unfortunately beaten 3-0. 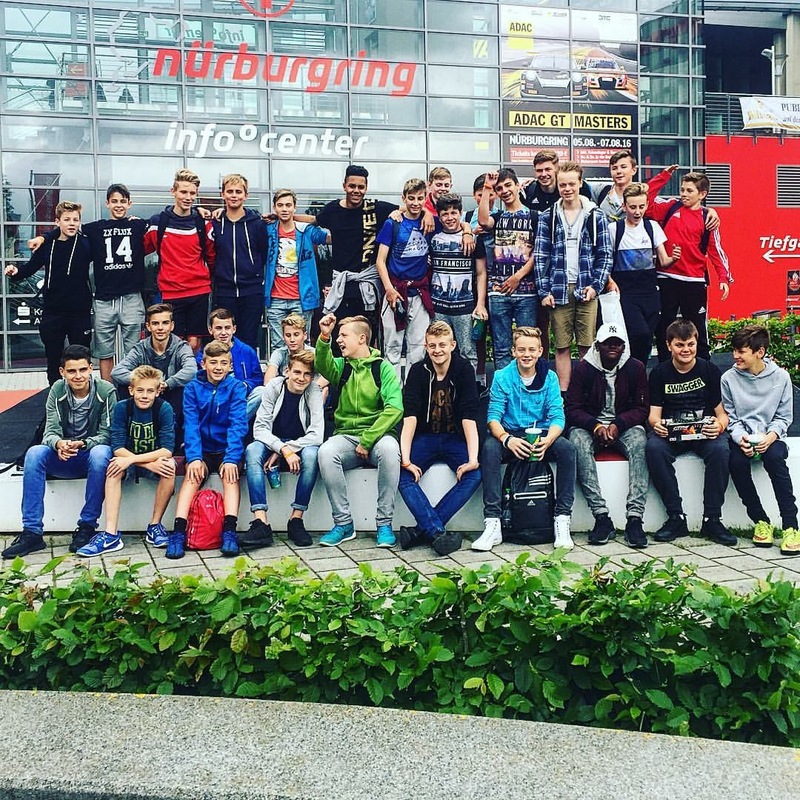 Various other social events were also undertaken during the weekend including trips to Cologne, the Nurburgring racetrack and horse-riding. Everyone assembled in the Euskirchen City Forum on Saturday night with host families for an evening of entertainment, results and a disco to end the 20th Anniversary event. Basingstoke unfortunately lost the overall trophy 12-24 but won easily on the results cheering ! Teams left for home on Sunday morning sad to leave old and new friends, stopping for lunch in Brussels and arriving back in Basingstoke Sunday evening. The 21st event will be in Basingstoke in July 2013 and new clubs and schools are welcome to become involved if they can agree to reciprocal hosting. 2011 - Home outright trophy win ! 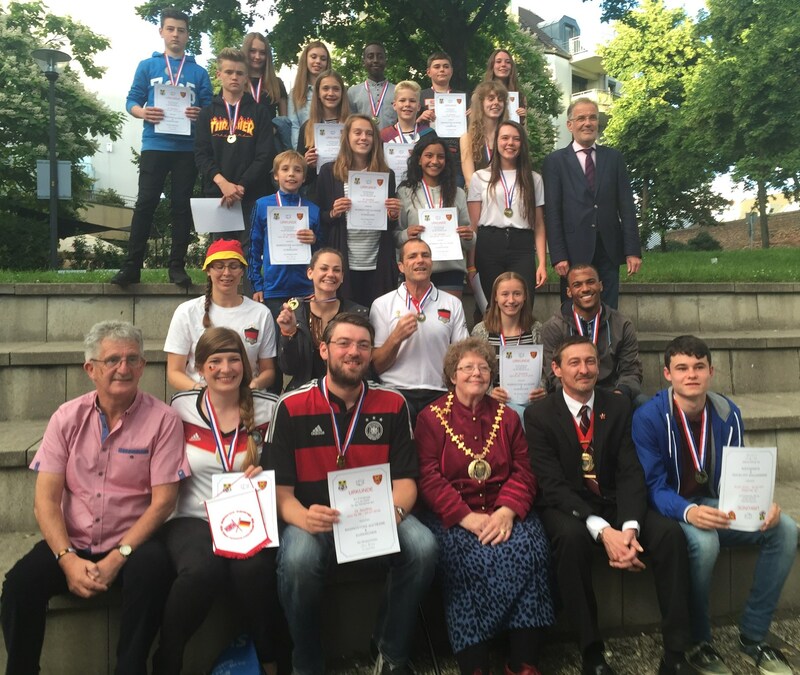 Over 170 German Sportsmen and Women travelled to Basingstoke on June 30th for the 19th Annual Festival of Sport to try and regain the overall trophy currently held by Basingstoke. All the visitors were kindly hosted by local clubs and schools for the weekend with many again meeting longstanding friends and others meeting for the first time ! Events took place over a very warm weekend mixed with a variety of social events, sightseeing plus shopping. Results were announced at the final night celebration where the 25-11 overall win meant that Basingstoke retain the trophy as outright winners. The only defeats were Junior Football where Euskirchen won 1-7 and the official sport which was marbles (2-3) held at the Civic Offices. Basingstoke winning teams were - Basingstoke Athletics (1865-1778), Basingstoke Junior Table Tennis (13-9), St Mary's School rounders (2-1) and Totally Tennis (24-5). Teams who drew were Summit Judo, Overton & Basingstoke Taekwondo, Academy of Dance, Everest School and Karate. Totally Tennis still remain the only unbeaten team in the Festival exchanges. Everyone met up at Milestones Museum on Sunday evening for Entertainment from the local Wolverine Cheerleaders, Basingstoke Academy of Dance, Fatboyz Dance Crew and MELO singers. After that the results were announced and trophy presented to the Basingstoke Mayor Cllr Leeks before everyone had a great time with the Disco presented by Mark Halliday. Euskirchen returned home on Monday morning July 4th and are already planning and looking forward to our visit in late June 2012. Basingstoke have been closing the points gap over recent years and a rare win away from home next year in the 20th Anniversary event would provide the required 3 points to put things all square ! 2010 - Drawn event ! Over 170 Basingstoke & Deane Sportsmen and Women travelled to Euskirchen on June 30th for the 18th Annual Festival of Sport to defend the twin town trophy they won at home in 2009. After arrival and a light breakfast on Thursday morning July 1st most groups spent the day in the local Phantasialand themepark prior to meeting host famillies later that evening. Events took place over a very hot weekend (30 to 35 degrees) mixed with watching Germany beat Argentina in the Football World Cup Quarter Final, social events plus shopping. Results were announced at the final night celebration where the 20-20 overall draw meant that Basingstoke retained the overall trophy as the travelling town. The winning teams were - Basingstoke Athletics, Basingstoke Junior Table Tennis, Basingstoke Town Colts Boys FC, Summit Judo, Overton & Basingstoke Taekwondo and Totally Tennis. Totally Tennis remain the only unbeaten team in the Festival. 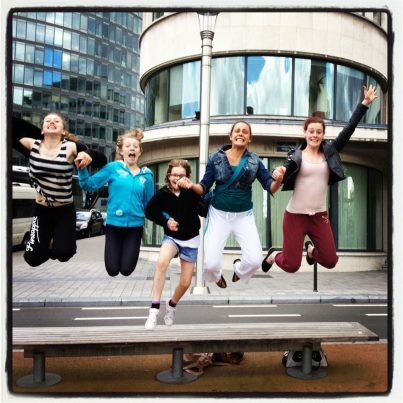 Teams returned home on Sunday morning July 4th via a lunch stop in Brussels and beach stop in Calais before catching a delayed ferry to arrive back in Basingstoke late that evening tired but happy and with new friendships made. 2009 - Trophy regained after eight years ! 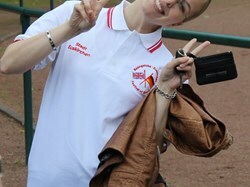 Approximately 130 German Sportsmen and Women visited Basingstoke to defend the twin town trophy they won at home in 2008. Events took place over a very sunny weekend mixed with social events and shopping and results were announced at the final night celebration evening at Milestones Museum. Basingstoke won the overall trophy for the first time since 2001 with a convincing 21-9 score and the winning teams were - Athletics, Calleva Girls Football, St Mary's School Rounders and Tennis plus two sports won for the first time in year's of exchanges and were Taekwondo and Volleyball. Gymnastics and Everest School drew their event and Euskirchen won the Civic game and Judo. Nearly 100 Sportsmen and women travelled to German twin town Euskirchen on Wednesday night May 14th and arrived on Thursday morning before spending the day in the local Phantasialand themepark. Everyone met their host clubs and families Thursday evening and various sports and social events took place over the weekend. On Saturday evening everyone met for the results and disco at the local lake in the forest and the trophy was retained by Euskirchen. Basingstoke had taken less participants than normal and some teams were weakened due to the date clashing with school exams. Although beaten, The Civic party (3-13) at Bowls, Athletics (73-84), Taekwondo (6-7) and Volleyball (0-3) both put up very good performances with Judo (1-6) and Overton Boys Football (2-11) also fighting hard for a result. Calleva Girls Football played very well to win an exciting game (7-5) and Totally Tennis retained their unbeaten record against Euskirchen. Everyone travelled home on Sunday stopping in Brussels for lunch before arriving home late on Sunday night. Another great weekend of sport and friendship ended with the results being announced at Milestones and as in 2006, the total score resulted in a draw. The rules of the Festival meaning that Euskirchen won the right to take the trophy back to Germany. A 200 strong party from Basingstoke travelled overnight to Germany spending the first day again in the excellent Phantasialand Themepark. Saturday and Sunday saw a mix of sightseeing, social and sporting activities. Robert May's School demonstrated Netball while Euskirchen reciprocated with Handball and then both teams played a game of rounders. Overton Boys lost 1-4, Berg drew 0-0 against Flamersheim FC, Berg U.14 Girls won 2-0 and Calleva Girls drew their game. Basingstoke Bluefins Swimming were engaged in a fun swim weekend but a young Basingstoke & Mid Hants Athletics team were soundly beaten. Judo lost 5-6, Taekwondo won 11-9 and Totally Tennis won 6-5. 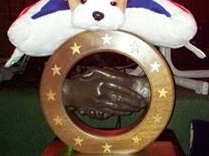 As the overall score was a draw, Basingstoke had the right to bring the trophy home to England. Sunday evening saw an evening of results and celebration and teams travelled home on Sunday having lunch in Brussels and stopping in Calais before boarding the ferry. Another successful sporting weekend with our German twinning counterparts. The 2005 event was another great success for the twinning links between the towns with approximately 170 sportsmen and women visiting Basingstoke for the 13th Annual Festival of Sport over the weekend of July 1st to 4th. German visitors arrived on Friday evening to be met by host Basingstoke families and clubs and spent the first night socially. Saturday was a mix of competition and additional social activities including visits to London City, Thorpe Park and the beach etc. Saturday night was additional club events including a large barbecue for the young competitors where fun and games plus disco were also enjoyed by all. Sunday evening was the results night plus celebration disco evening at Basingstoke Ice Rink and the German teams departed for home Monday morning tired but victorious. Euskirchen had a strong Athletics group but were beaten 3390-3108 by Basingstoke & Mid Hants Athletics Club youngsters in a competition as part of the club championships. Berg Girls football was far too strong for VFR Flamersheim winning 6-0 and Overton Boys football lost on penalties to the Germans in their Six-a-side tournament final plus lost 3-0 in the official match. Euskirchen brought teams from a local school to participate in a mix of Trampolining, Ring Rhonrad and Gymnastics with Robert Mays school plus a Girls Handball team learnt Netball and they played each other in a friendly match. Volleyball had their best games ever against Euskirchen but were still defeated 1-3 and a very strong and talented Euskirchen Tennis team beat Robert Mays 7-20. 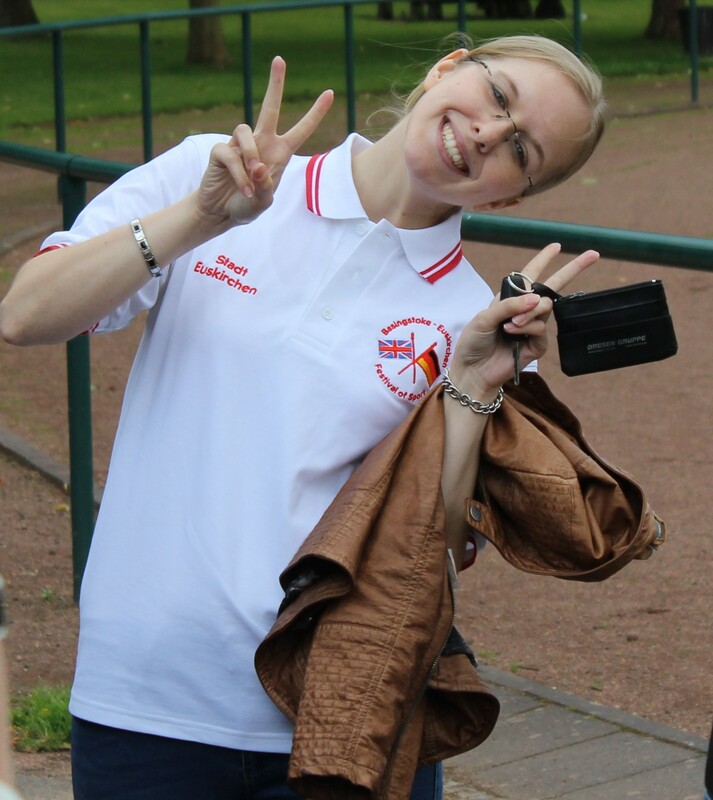 Basingstoke Taekwondo lost 24-42, Judo lost 2-5 and the Euskirchen officials won the Civic event of Cow roulette ! Final overall score of 11-23 to Euskirchen who took the trophy back to Germany.